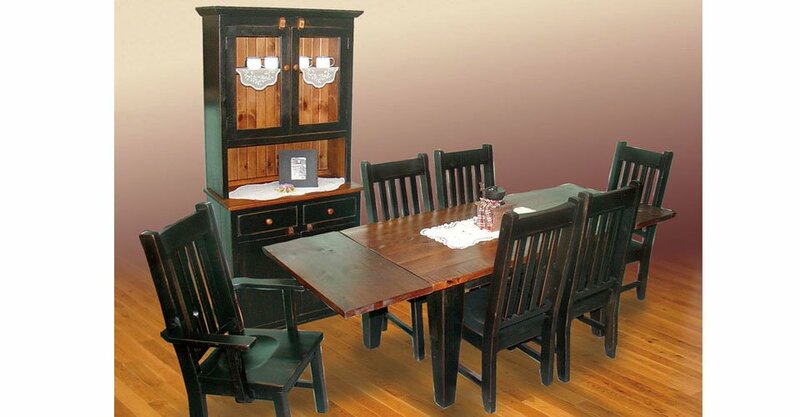 Our Rustic Dining Set replicates the primitive country style that was used by many Americans and Canadians during the 17th and 18th centuries. It is crafted from solid pine or wormy maple woods and finished with a rustic paint/rubbed finish. It is handcrafted by local craftsmen and built from heavy stock (thick wood). Each piece is meticulously finished to bring the essence of the era into your home. 38w x 60L with 2" to 18" ext. Available widths: 38, 42, 48 Inches and Available lengths 48, 60, 72, 84, 96, 108, 120 Inches with with 1-2 18" ext.